With the possibility of a Booster Gold TV show next year I wanted to catch up with the DC comics B lister. For a DC character he is still fairly young in print with the first Booster Gold comic published in 1986. Since then he’s been evolved in most of the big DC events and has had cross overs with all the main characters . Now he has a lead part in the DCnU Justice League International. 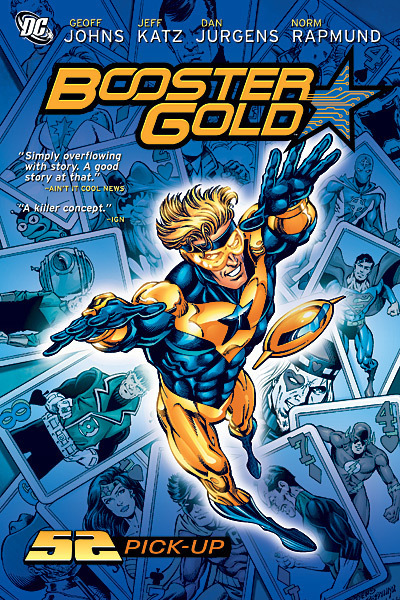 One thing I like about Booster Gold is his origin, his background isn’t the classic DC story. His parents didn’t die and he’s not the last of his alien kind. Booster’s just a glory seeking sports personality from the future turned time traveling glory seeking super hero. 52 Pick-Up follows on after the 52 Event which involved just about everyone from DC. It starts with Booster trying to get recognition as a real hero and seeks to join the JLA. He’s told they will give him a week to be a hero and in that time they will keep an eye on him. At that point the story starts to develop into a mega cross over through time series. A mysterious character called Rip travels from the future enlist Booster to help save the JLA. If Booster helps Rip he gets to save Ted Kord the previous Blue Beetle and his late best friend, if he refuses the JLA never form. The villains of the story are an evil Supernova and Rex Hunter are also traveling through time trying to replace the JLA by ruining there origin and becoming the heroes of all the DC events. In 52 Pick-Up we see Hal Jordan being prevented from becoming the Green Lantern thanks to Sinestro. Superman is raised by the Luthors and killed by Lex. It’s all pretty confusing and a story only Geoff Johns could write with his inside knowledge of the DC Universe. Once Booster fixes time Rip then gives him the chance to Save Barbra Gordon from being shot by the Joker. This would have made an awesome intro to the DCnU Batgirl as the whole shooting never seemed to have happened. It turns out Barbra is beyond saving as it was her destiny to become the oracle. Then the last chapter Booster tried to save Ted Kord from being shot. This he does manage to do with the help of the first Blue Beetle and one from the future. Again it’s a tough story to follow at times but much better than I’d expected. Geoff Johns really does know the DC Universe inside and out being the one who orchestrated the whole DCnU reboot. It gives you a great introduction to Booster Gold and what makes him tick. It’s also a great book if you love the DC universe as it was, nothing really made total sense but you let it slip just because of your love for the characters and you’d been used to it. I’d love to see what someone who hasn’t read any DC comics would think of the book as it’s a total fan boy graphic novel.